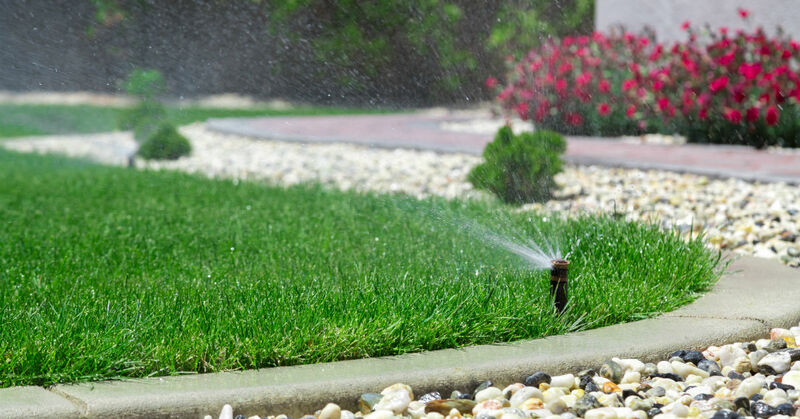 One of the many landscaping services we offer at Stonetree is sprinkler system installation, troubleshooting, repairing, and help in setting your watering schedule. With our help, your landscaping can stay healthy and beautiful for years to come. While installing a sprinkler system does not require professional help, there are several reasons why it may be better to work with professional contractors who have extensive experience installing sprinkler systems. Sprinkler placement can be a long, hard process. Installing a sprinkler system is not as easy as just buying sprinklers and placing them around your property. The places where your sprinkler pipes will be placed will need to be dug up, the correct sprinklers bought for your property, sprinkler heads adjusted to the correct spray, pipes sealed so they don’t leak, and have the whole system hooked up to your home’s water. At any point during this process, many things can go wrong and derail the whole installation. The shape of the property to be watered can complicate installation. If your yard is a perfect square, you may not have a difficult time setting up your sprinkler system. However, even without creative landscaping, most yards have odd shapes which make it more difficult to determine the correct sprinkler coverage. Our team has years of experience in plotting sprinkler system installations and will be able to map out the best way to install the sprinklers. May damage the lawn by DIY sprinkler installation. Inexperienced installers may irreparably damage your lawn, requiring you to reseed or re-sod areas where the sprinkler pipes were placed. Many times, our team installs a sprinkler system as part of a whole lawn landscaping project, so there is no visible damage. Should you already have an existing lawn that requires a sprinkler system installed, our landscaping contractors will ensure that areas which needed to be dug up for pipes will be repaired before the job is finished. Professionals only use high-quality sprinkler systems. At Stonetree, we use either Rainbird or Hunter sprinklers when we perform a lawn installation. These two kinds of sprinklers are of the highest quality, lasting for years and keeping landscaped yards healthy. Professional landscape contractors are able to access supplies not available to the general public, which is another reason to work with qualified contractors. Can save money in the long-run with qualified contractors. Some people choose to attempt their own sprinkler system installation under the impression that it will cost less. However, we have had clients who have attempted, only for things to go wrong. After disaster has struck their sprinkler project, then they have turned to us. You can cut out the extra expense as well as the wasted time by coming to us from the beginning of your sprinkler system installation. Soggy lawn – You will want to check all the sprinklers in the area of the soggy lawn. There is likely some damage to the sprinkler head so the flow is no longer regulated. This may require the replacement of the sprinkler head or just an adjustment to the flow nozzle. There also may be damage to the underground pipes which could be causing too much water to come out in that area. Dried up lawn/plants – If your plants or lawn are drying up, start by checking the sprinkler heads in the area to see if they have become obstructed. If there is no obstruction, check the neighboring sprinklers to see if water is pooling near them. If too much water is coming out from another sprinkler, there may not be enough water pressure to force other sprinklers down the line open. Watering at wrong times – Generally, this is a fairly easy fix. You will need to just check your sprinkler timing system and ensure that you have the correct times and dates input. If the timing system is malfunctioning, the manufacturer will need to contacted to help repair it. No water coming out – Should there be no water coming out of your sprinklers, there are a few things you should try. First, be sure that your system is on and programmed with the right watering timetable. Check your system’s connection to the water line and make sure the connection is secure. Also, visually inspect your sprinklers for any obstructions. If you have done all this and still cannot make your sprinklers work, give us a call. For more information on troubleshooting your sprinkler system, check out our lawn care guide chapter on “Sprinkler System Care”. When sprinklers break down, sometimes the repairs are simple and other times it can be difficult to fix the sprinkler system’s problem. This is especially true when it comes to repairing the pipes of a sprinkler system. Our team of contractors can help you with all your sprinkler system repairs. We will assess the problem, discuss solutions with you, and only proceed with the repairs once we have your agreement. By working with Stonetree on all your sprinkler repairs, you can ensure the right parts will be used and the work will be done quickly so your landscaping won’t suffer. Don’t water after 11 am – In our dry desert climate, it is a waste of water and money to water after 11 am. Check watering – You don’t want to under- or over-water your landscaping as either can damage it. Check by inserting a metal rod (can be a screwdriver) into your grass. If it’s hard to push it in, your lawn needs more water. If it slides in too quickly and comes out muddy, you will need to cut back on long you are watering. By working with Stonetree, we will help you program your sprinkler system to make sure your landscaping is receiving the ideal amount of water. If you are ready to work with a Stonetree sprinkler system contractor, feel free to contact us. We are ready to tackle projects of any size, so reach out when you are ready to have your landscaping needs met with the highest level of care.